Why is my calendar disconnected? Why Doesn't Drift Live View Match Google Analytics? Troubleshooting: Why Can't I See My Widget? Why Can't I See The Changes I Made to My Playbook? Why isn't my Playbook showing on my site? Why Aren’t My Sales Sequences Working? Head to Settings > My Settings > My Email, or click here to make sure you've connected your Gmail account to Drift. Have you installed the Chrome extension? To send Sales Sequences through Gmail, you must have the Chrome extension installed. You can download it here! You can also check the status of your extension by going to chrome://extensions to double-check if you’ve installed the extension! Here's what it should look like in your browser if it's installed. This is to the right of the URL bar at the top of your Chrome window. Have you set up a Sequence? Is your calendar connected and is your Drift profile public? 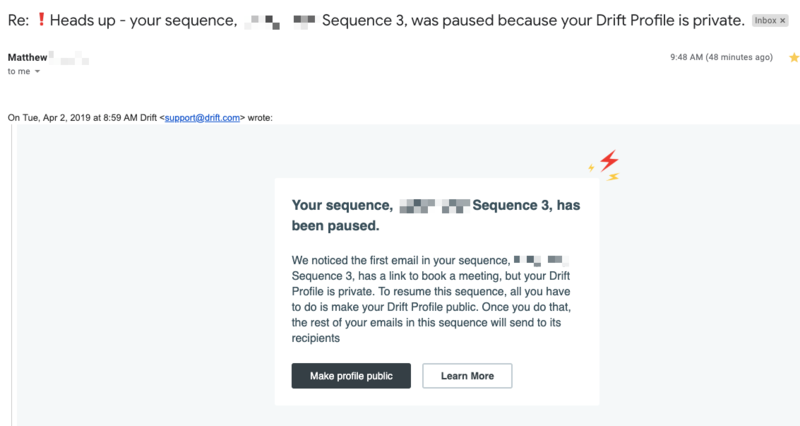 If you're including your calendar or upcoming availability in your emails, we automatically pause your sequence when we detect that a calendar has been disconnected, hasn't been connected, or if your Drift profile is not public. You'll receive an email from us with the sequence that was paused and the reason. To check the status of your Drift profile, click here. Questions? Let us know! If you're not using Drift yet, get your free account!